While enjoyed throughout the holiday season in Puerto Rico, especially in the Mateo household in Coamo, this sweet rice pudding is traditionally served for dessert on Christmas Eve. 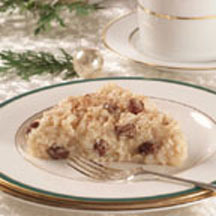 Raisins, cinnamon, and coconut milk flavor the pudding mixture, which is cooled in pie plates or a baking dish then chilled until firm and cut into wedges for serving. The rice is soaked for two hours before it’s cooked, so be sure to allow time for this preparation step. Grease two 9-inch pie plates or 13x9x2-inch baking dish. Divide rice mixture between two pie plates. Cool for about 2 hours. Sprinkle with cinnamon. Refrigerate for at least 2 hours. To serve, cut into wedges or squares. Nutritional Information Per Serving (1/16 of recipe): Calories: 190 Calories from Fat: 60 Total Fat: 7 g Saturated Fat: 6 g Cholesterol: 0 mg Sodium: 160 mg Carbohydrates: 29 g Dietary Fiber: 1 g Sugars: 17 g Protein: 2 g.